We’d love your help. Let us know what’s wrong with this preview of Here Comes the Corpse by Mark Richard Zubro. Chicago area high school teacher Tom Mason and his lover, professional baseball player Scott Carpenter have had a taxing year. After publicly coming out, Scott and Tom have had to deal with a firestorm of publicity, a major loss of privacy, a great outpouring of support and an equal number of cranks. Now, finally, they are going to do something that they've always wanted - Chicago area high school teacher Tom Mason and his lover, professional baseball player Scott Carpenter have had a taxing year. After publicly coming out, Scott and Tom have had to deal with a firestorm of publicity, a major loss of privacy, a great outpouring of support and an equal number of cranks. Now, finally, they are going to do something that they've always wanted - get married in a service before their family and close friends. Despite the potential problems of such of an event, the ceremony comes off with nary a hitch. With the reception in full swing - with a guest list ranging from long-time family friends and co-workers to the cream of the social elite - a small problem emerges. Tom happens to stumble over an ex-boyfriend from many years ago in the bathroom. Unfortunately, what he stumbles across is actually the corpse of the murdered ex-boyfriend and in addition to casting something of a pall across the proceedings, it puts Tom in the awkward position of being the prime suspect in the murder. If he's ever going to get to go on his long-planned honeymoon, Tom is going to have to uncover the truth behind the murder of this unwanted guest. To ask other readers questions about Here Comes the Corpse, please sign up. Gay Romance "Going to the Chapel"
More fiction than romance, it's the first book by Mark Richard Zubro I've read. Tom, a former Marine (I think) and now teacher, get married to long term lover, Scott, a pro and famous baseball player. It's told on Tom's POV and I liked Tom's voice a lot. He is a no nonsense guy, acerbic, a bit cynical, and very in love with Scott. He also has a great dislike of right wingers, and he tends to put them all in the same basket, which I disagree with. You've got haters among right wingers and among l More fiction than romance, it's the first book by Mark Richard Zubro I've read. Tom, a former Marine (I think) and now teacher, get married to long term lover, Scott, a pro and famous baseball player. It's told on Tom's POV and I liked Tom's voice a lot. He is a no nonsense guy, acerbic, a bit cynical, and very in love with Scott. He also has a great dislike of right wingers, and he tends to put them all in the same basket, which I disagree with. You've got haters among right wingers and among liberals, just like you have decent people in both groups. The mystery is engaging, though the dialogues sometimes have an info dumping quality that makes them less natural. In spite of that, it's a great read! PS: It's not a romance AT ALL, though the characters are in love and they have some romantic moments, sweet and adorable. By the time the murderer was revealed, I only vaguely remembered him (them, actually), from earlier in the book, so it wasn't the shocker of an ending it might have been. But, I continue to enjoy both Zubro series, and am about to start on his book, SCHOOLED IN MURDER. This was one of the worst books I have ever read! Childish prose, ridiculous plot, I hated it! 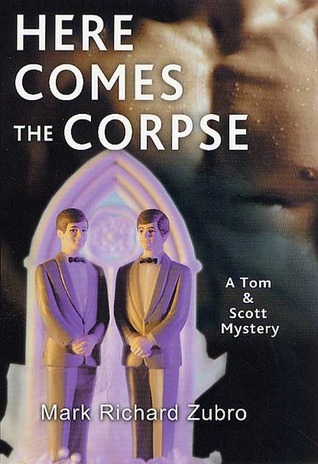 Good gay mystery which starts with Tom and Scott's getting married. Too bad Tom finds a body in the bathroom at the reception.